Finlay Scott form Jedburgh Grammar School was recently selected to represent Scotland at U16's level. Finlay Scott from Jedburgh Grammar School was recently selected to represent Scotland in rugby at U16’s level. The Jed Thistle forward has just returned from the BMW Wellington Rugby Festival in Berkshire where there were teams from England, Wales, France, Italy and Scotland competing. “I really enjoyed the experience and hope to continue with my rugby at a high level in the future,” he told The Southern. Finlay was fortunate enough to be selected to play a part in all three games down at Wellington College. 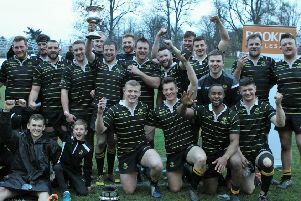 During the week the Scots played England North, defeating them 27-19, then in the second game they came up against a very strong Welsh team and were defeated 48-0. In the final game they were defeated by England South West 34-14.